Aerial lifts provide a working platform for usually inaccessible areas. Typically, they’re used for painting, maintenance work, construction tasks and even electrical work. Gaining knowledge about their characteristics and capabilities is helpful, especially if you’re considering purchasing an aerial lift. From a mechanical perspective, there are 2 basic types of aerial lifts: telescopic and articulated. They’re used for different purposes, but each is considered an aerial lift. Articulated lifts and telescopic lifts are also different than another type of aerial work platform (AWP), the scissor lift; articulated lifts and telescopic lifts (also called boom lifts) reach much higher than scissor lifts. – Telescopic: These aerial lifts are used to access extreme heights. Telescopic lifts can reach up to nearly 100 feet at a time (usually 70-90 feet). They’re utilized for building maintenance, electrical work and other construction purposes. Telescopic lifts are the most common type of aerial work platform, and are used for painting, window cleaning, tree trimming, and even surveillance. Because they can lift so high, telescopic lifts usually include stabilizers. Hydraulic power is the preferred energy source for telescopic lifts. One of the tallest aerial lifts available is the Elliott E160/215, which can reach a working height of up to 215 feet! Telescopic aerial lift training requirements: If you plan to operate a telescopic aerial lift, it helps to have the most recent OSHA-approved training available. CMO’s aerial lift training courses cover all the key safety concepts involved with telescopic aerial lifts! – Articulated: For those tough to reach areas, articulated lifts provide custom positioning. Workers involved with tree trimming, power lines and other constantly fluctuating heights and angles use articulated lifts. Inside, they’re used for everything from changing light bulbs, accessing warehouse pallets and more. Because they’re considered a “specialized” type of aerial lift, there are other operating considerations to account for when using an articulated aerial lift. With CMO’s complete and comprehensive training programs, we’ll provide the skills and knowledge you need to operate an articulated lift confidently! Articulated aerial lift training requirements: With articulated lifts, fall protection training is definitely recommended (as it is for telescopic lifts as well). Our fall protection training and certification reviews personal safety harnesses, proper operating techniques, and much more. Because aerial lifts can reach soaring heights, safety is an important factor. When purchasing or leasing an aerial lift, some crucial considerations include operating conditions (weather, wind, etc. ), desired height, working surface (concrete, grass, etc. ), maintenance, safety harness procedures, obstructions (both above and below the aerial lift) and proper training. If you want to gather more information about aerial lifts, the best way is to visit a manufacturer or distributor. Just like new cars are taken out for test drives, aerial lifts can be tested for rigidity, strength, height stability and other attributes. If you can’t visit one of these facilities, visit aerial lift manufacturer websites for additional data. – 5 Easy Step System. With CMO, you’re up and running in no time. It’s easy to get started, and you can begin your OSHA aerial lift training program within minutes of signing up. – Affordable pricing. At CMO, we believe everyone should become OSHA compliant. Too often, expensive training “solutions” end up causing more problems than they aim to solve. But CMO is run by OSHA experts and many industry veterans who know the ins and outs of proper, comprehensive training. We put an affordable price point on all of our training sessions, so you don’t have to worry about your bottom line interfering with the most important thing of all: worker safety! – Flexible training. From our Train the Trainer course to our Fall Protection module, you’ll have everything you need to become OSHA compliant. This is beneficial for employers and employees. And if you’re looking to launch your career as an AWP operator or aerial lift employee, it really helps to have the latest OSHA training available. CMO gives you this and more – plus lifetime support and 3-year renewal training, too! Our Aerial and Scissor Lift training program offers many advantages. This comprehensive package saves money and eliminates needless hassle. Plus, credentials and certificates can be printed instantly for no downtime. Many reputable companies have utilized our service, including Coca-Cola, Dow Chemical, Harley-Davidson, Siemens and more. Just give us a call at (602) 277-0615, or contact us with an email. We’d love to hear from you. If you’re interested in becoming an aerial lift operator, it helps to know all the most common types of equipment you’ll be using. And even if you’re a veteran AWP employee, perhaps you’re looking for a career change of pace. CertifyMeOnline.net has helped train thousands of people all over the country with OSHA-approved instruction. One reason why our training is so popular is that it covers different pieces of equipment. In our 5 Types of Aerial Work Platforms infographic, we break down a handful of commonly used AWPs. 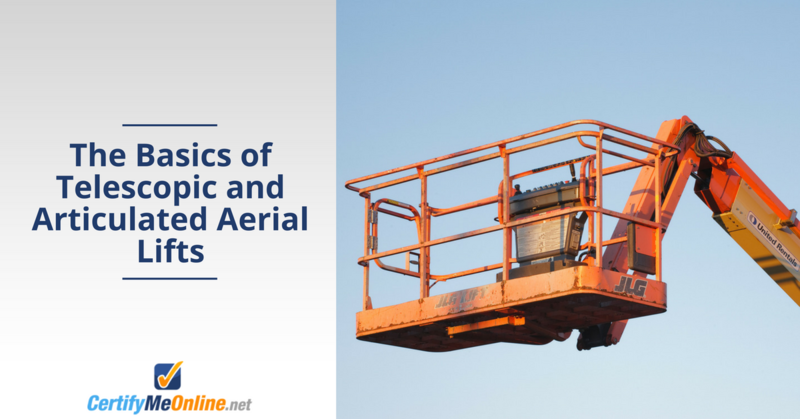 In fact, this informative infographic covers the two types of AWPs you learned about in the blog above, the articulating aerial lift and telescoping aerial lift. While those are two of the most frequently used AWPs, there are some others you may not be aware of. From the unique looking spider lift to the trusty cherry picker, this infographic will explain what makes each AWP unique, and exclusively suited to perform different tasks, from construction to painting to rescuing cats from treetops! Check out this CMO infographic today – you’ll be surprised at all the fascinating, user-friendly jobs aerial lifts are capable of!